When it comes to dairy and the Paleo diet, some debates pop-up and dairy definitely is in a grey zone. In the strict Paleo sense, dairy of any form was not consumed in the paleolithic era, other than human milk in infancy of course. It just wasn’t very practical to milk wild game. The mere fact that something wasn’t consumed during the paleolithic era doesn’t make it bad, but experience as shown us that it’s unfortunatly often the case. Dairy is no exception. Being the first nourishment a newborn gets and one that kick-starts its growth, milk is loaded with nutrients, saturated fats, beneficial bacteria, essential fatty acids, proteins and carbs. It’s very insulin promoting and this is due to the fact that it’s growth promoting. In this sense, someone trying to gain weight and NOT having autoimmune, acne or insulin sensitivity related issues could benefit from dairy in his weight gain program. If you decide to consume dairy, refer to the end of this article for the best dairy choices. Dairy can also be a very good way to introduce beneficial bacteria in your gut with yogurts, kefirs or even cheeses. In fact, fermented dairy is, in my opinion, one of the best choices you could make if you decide to consume it, mainly because of the good bacteria, but also because the fermentation process will consume most of the sugars. This is a good thing because milk’s main sugar, lactose, is often a problem and because it will reduce insulin response. Like I discussed briefly, lactose is not well tolerated by most people. Even if it’s seemingly unnoticeable, removing lactose from the diet can make a good difference. In fact, our pancreas produces lactase, the lactose digestive enzyme, up until the age of two to cover the period where we are really supposed to drink the stuff. Another point to make is that we are not supposed to drink the milk from other animals. We are the only mammals who do it. This often translates to intolerance or allergy to one of milk’s proteins, casein. It’s believed, though, that the casein in goat of sheep’s milk, the A2 form instead of A1, causes less or no problems. 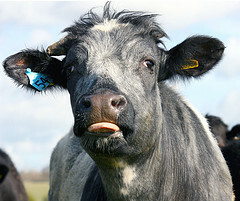 Some breeds of cows also produce A2 casein, but those are not bred very much in North America. Lactose and casein are also being actively studied for other possible related problems. One study I came across entertained the possibility of links between dairy and Chron’s disease. Hard cheeses, yogurt and kefir that have been fermented long enough to eat up all sugars won’t have any lactose left, so it’s a good alternative for the lactose intolerant. Even without lactose, dairy will still have this insulin promoting effect. Finaly, since dairy is growth promoting because of a multitude of growth factors like IGF-1 (Insulin-like growth factor 1), undesirable things like acne can become a problem and some people argue that cancer cells could also develop much faster with dairy. It is a yellowish pre-milk liquid that becomes a newborn’s first food and as been studied for having a lot of benefits in terms of immunity (antibodies), beneficial intestinal flora and growth. All those things are primordial for a newborn. In the recent years, bovine and goat’s colostrum supplements have gained a lot of popularity for adult consumption. Some studies show benefits for healing leaky gut syndrome, providing immune support and a host of other intestinal and gut pathogen related problems. It as also effectively been used for accelerated muscle and strength gains, mainly due to its multiple growth factors. It goes without saying that colostrum will contain lactose and casein and this could become a problem. It’s also of the first importance to choose a product that comes from an animal that has been pasture-raised and grass fed, you wouldn’t want colostrum for a sick animal, would you? Preferably choose a goat’s colostrum so risks associated with casein are reduced. Finally, note that while growth factors are often a good idea short-term to help the body heal an inflamed, irritated and ulcerated gut or to put on muscle for someone who recovers from a disease where lots of weight was lost, long-term use could shorten your life (you grow faster, you age faster, it’s just fair), give you acne or help cancer cells grow. Make a conscious choice and consider the trade-offs. Even if you’re not lactose or casein intolerant and are not worried by the weight gain or higher insulin levels, regular grocery bought milk is still a very poor choice. The cows probably ate a diet of corn and soy while confined in a very tight environment. As if it wasn’t enough, we skim the milk to reduce the healthy saturated fat and we pasteurize-it, rendering some enzymes and beneficial bacteria infective. As if it was not enough, those cows are on growth hormones and antibiotics, so you get the by-products of this. Trust me, unless you have a condition that really requires for its use, you should stay far away from anything related to antibiotics, you’ll thank yourself latter. Do not despair though because grass-fed, pasture-raised and organic cows will produce a milk of a much higher quality. Other than the heart healthy saturated fats (in your face grains! ), it’s high in vitamin K2, omega-3 fatty acids, CLA (Conjugated linoleic acid), a powerful antioxidant and anti-cancer linoleic acid. Note that the K2 and CLA are mostly in the fat so you’ll get all the benefits of it just by consuming butter without the risks associated with milk’s lactose, casein and carbs. A lot of people following the Paleo diet won’t consume regular milk, cheese or yogurt, but will enjoy generous amounts of butter. I think it’s a sensible choice because it’s almost only fat and especially saturated fat with usually too little lactose to cause a problem. In my opinion though, we can easily go one step further in our healthy habits without complicating things much more with clarified butter (also known as Ghee). 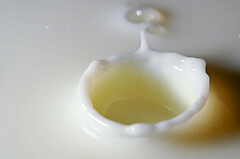 Clarified butter is butter that has been slowly melted so milk solids separate and traces of water evaporate from it. What you get in essentially pure butter fat, which is absolutely delicious and healthy. It’s heat resistant so you can cook with it at high temperature (regular butter can burn) and it will stay good for a long time, even at room temperature. Unless you’re dealing with severe autoimmune diseases, I only see advantages to consuming generous amounts of clarified butter. It goes well with just about everything. Again, choose grass-fed and pasture-raised when choosing butter. A good source of such clarified butter online is Pure Indian Foods, but it’s also easy to make your own at home if you have access to good butter. Milk’s other main protein, whey, as been used as a protein supplement in powder form for a long time now. I haven’t found evidence of problems caused by it when using a good quality whey supplement, but bear in mind that drinking your calories will always trigger a higher insulin response. I personally don’t like the idea of consuming whey protein as a protein supplement instead of real food, but I realize that it’s god-sent for some athletes. If you decide to consume dairy, I would aim for organic, pasture-raised, grass-fed, full fat and fermented (yogurt, kefir, cheese). If you want to go even further, try to find raw dairy direct from the farmer, which will retain all the original properties of the milk. Heck, since we’re there, look for goat or sheep’s milk. It can’t get much better than this (raw, pasture-raised, grass-fed, full fat goat’s yogurt)! To summarize, we’ve seen that we don’t reject neolithic foods solely on the basis that caveman didn’t have them, but prefer to have evidence as to the health effects of our food choices. A good example of food that is universally acceptable on the Paleo diet is clarified butter, because it’s composed similarly to other healthy saturated fats.